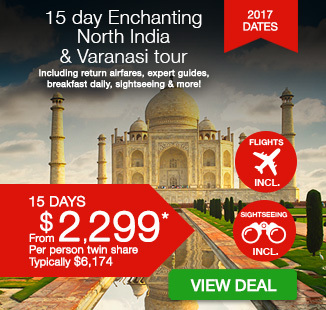 15 day Enchanting North India & Varanasi tour with return airfares, expert guides, breakfast daily, sightseeing & more! 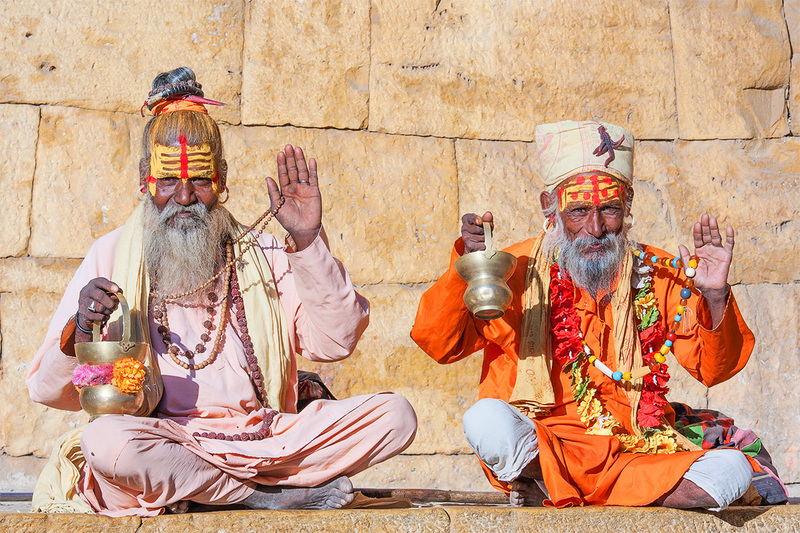 Experience an unmissable, fully-guided 15 day Enchanting North India & Varanasi tour! 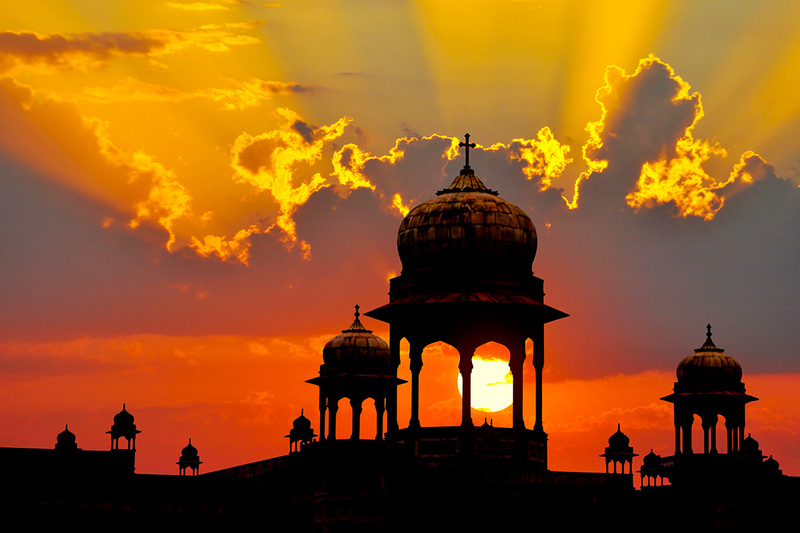 Start your journey in India’s capital, Delhi, a major gateway to the country. Enjoy local cuisine, see the Red Fort and the President’s residence, the Rashtrapati Bhawan. Be awed as you walk inside the famous Taj Mahal, find enlightenment at the holy site of Daswamedha Ghat in Varanasi. No trip to India is complete without experiencing a train journey! Ride on one of the most famous rail networks in the world from Lucknow to Delhi. Marvel at the beauty of the region’s diverse landscapes and learn the history of this cultured and treasured land, all with the knowledge and guidance of expert guides. Your package includes return international airfares, accommodation, dedicated tour guide, breakfast daily, sightseeing, entrance fees and more! Depart Australia today on your flight to Delhi (please note, some flight may depart 1 day before). You will arrive at New Delhi International Airport. Following customs, immigration formalities and baggage collection, a Webjet representative will meet you as you exit the arrivals hall. India’s capital and a major gateway to the country, contemporary Delhi is a bustling metropolis, which successfully combines in its folds – the ancient with the modern. Amidst the fast spiraling skyscrapers, the remnants of a bygone time, in the form of its many monuments, stand as silent reminders to the region’s ancient legacy. Delhi is a food-lovers haven and has something to please every palate. There is an unlimited variety available across cuisines, across price-brackets and across experiences – from street food of North India to International cuisine and from road-side dhabas to fine dining – Delhi has it all. Today we head out on a full day to explore Delhi. Begin your day with a guided tour of the Old City of ‘Shahjahanabad’. Your introduction to the city will start with a visit to Raj Ghat – the cremation site of Mahatma Gandhi, drive past the Red Fort—the magical monument in red sandstone built at the pinnacle of the Mughal Empire. From here proceed by bicycle rickshaws through the bustling streets to Jama Masjid, the largest mosque in Asia built by Shahjahan. Continue on a guided tour of New Delhi, which reflects the legacy the British left behind. You will visit Qutab Minar, the tallest stone tower in India built to establish the might of Islam and onset of Muslim rule in India and Humayun’s tomb, the first great example of a new distinctive style, which developed to become the hallmark of the Mughal Dynasty. We also drive past the imposing India Gate, the Parliament buildings and the Rashtrapati Bhawan (the President’s residence) before returning to the hotel. Tonight, get to know your fellow travellers with a welcome dinner. In the morning after breakfast we disembark for Jaipur. Jaipur, one of the most enticing places in India, is nestled between mighty forts and the rugged Aravalli Hills. It is known as ‘the pink city’ as its prominent buildings are washed in this colour. Founded by Maharaja Sawai Jai Singh in 1727, Jaipur is steeped in Rajput history and is characterised by sites such as the City Palace with its astronomical Observatory, Hawa Mahal and the beautiful Amber Fort. Jaipur is a bustling capital city and a business centre with all the trappings of a modern metropolis yet flavoured strongly with an age-old charm that never fails to surprise a traveller. On arrival the rest of the afternoon is free to explore this incredible city at your own pace. Optional Tour: Interaction followed by Dinner with Indian Family—Familiarise yourself with the climatic, cultural and historical influences that make India so diverse. Experience culinary delights, savour the tantalizing flavours and bask in a blend of aromas of Indian cuisine. Celebrate the love of food and listen to secrets from your hosts who are highly inspired from the rich traditions and exuberant hospitality that India is famous for! An exciting day awaits you as begin your sightseeing tour with a photo visit at the Hawa Mahal (Palace of Winds) – a five-storied wonder with a spectacular pyramidal facade and overhanging windows with latticed screens, domes and spires. 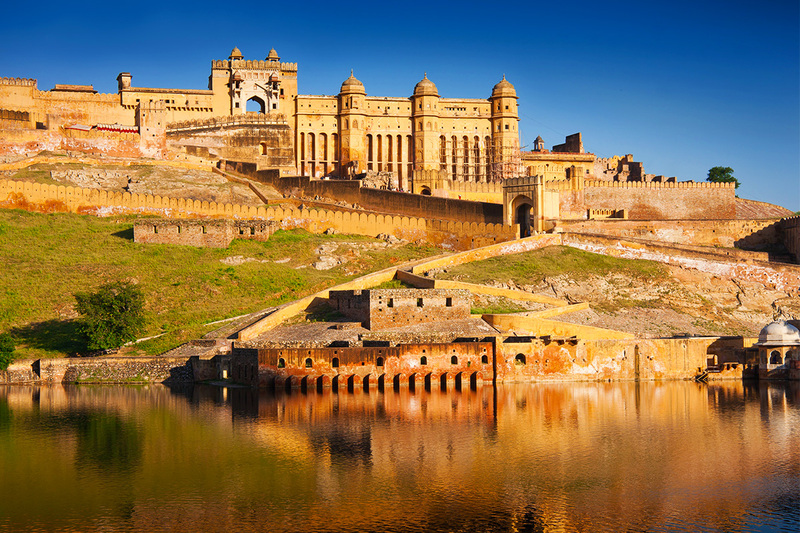 Continue your tour as you drive to the ancient capital of Amer to see the fabulous Amber Fort, situated on a ridge just outside Jaipur city, surrounded by fortified battlements. Maharaja Mansingh, Mughal Emperor Akbar’s most successful General, started the construction of Amber Fort in the 17th century. Before the City Palace was constructed in Jaipur, Amber was the seat of power. The fort is surrounded by fortified battlements and overlooks the Moat Lake. Ruins and remains are spread over the Aravalli hills and sprawling crenellated walls lattice the surrounding area. At the foot of the hill you will be taken on the jeep up to the main gate. Tour the chambers and hallways of the palace, famous for the excellence of its design and decoration. Within the complex is Ganesh Pol, an imposing gateway painted with the images of the elephantheaded god, Ganesh. The merging of Rajput and Mughal architectural styles is captured in the Sukh Niwas and Jas Mandir apartments, and the Charbagh garden with its perfectly proportioned landscaping. Pierced screen windows offer views from different vantage points and shimmering mirrors encrust the walls of Sheesh Mahal. Optional Tour: Elephant Trek followed by Lunch Experience a unique and interesting insight into rural Rajasthan as you drive through the countryside to the starting point of your trek. Beautifully decorated elephants await the arrival of the guests and the safari commences as the elephant and his well-dressed mahout salute the guests. You will be taken through a series of farms and fields and a few quiet villages tucked away in the countryside. Following which, a sumptuous lunch awaits amidst the rustic environs. 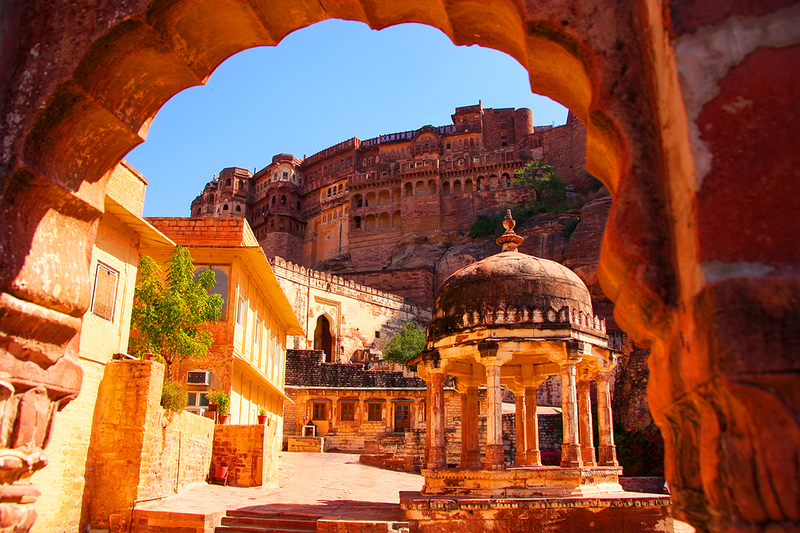 This afternoon, enjoy a tour of the Pink City, an “abode of rajahs”. The highlights of the tour include a visit to the City Palace Museum, which has a superb collection of Rajasthani costumes, and armory of Mughals and Rajputs including swords of different shapes and sizes with chiseled handles. Many antiques and artifacts belonging to the ruling family are housed here, including a collection of weaponry. It also has an art gallery with an excellent collection of miniature paintings, carpets, royal paraphernalia and rare astronomical works in Arabic, Persian, Latin and Sanskrit. Proceed to the aweinspiring Jantar Mantar Observatory, a stone astrological and astronomical Observatory built by Maharaja Jai Singh in the 18th century. Later, enjoy a rickshaw ride through the narrow bylanes of the colorful bazaars. The rest of the evening it at leisure. After breakfast, we head to the Mughal city of Agra en-route visiting Akbar’s abandoned capital, Fatehpur Sikri. Located 40 km from Agra, Fatehpur Sikri was built by Mughal emperor Akbar in 1571 in honour of the Sufi saint, Sheikh Salim Chisti. It was the Mughal capital for 14 years after which it was abandoned due to paucity of water. 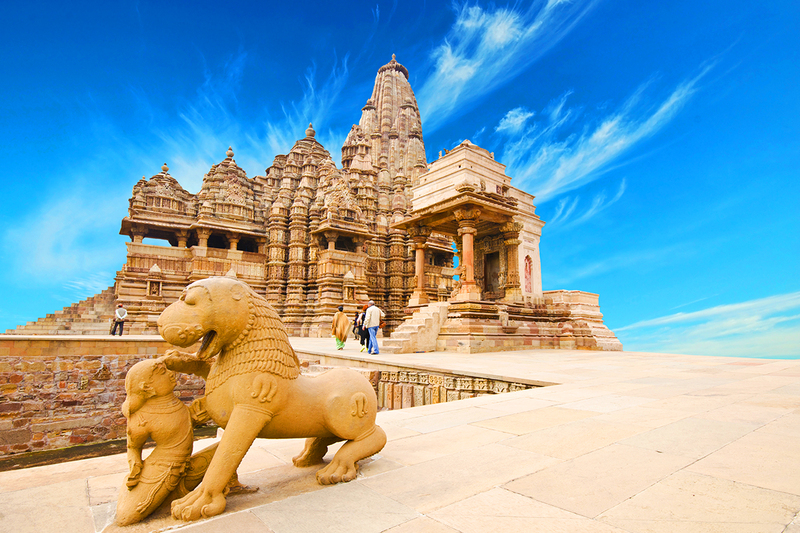 It is made of red sandstone and combines influences from both Hindu and Mughal architecture. Even to this day, the entrance to the fort is through the road that Akbar built which leads to the Buland Darwaza, a huge 54 metres gateway. Other inspiring monuments in Fatehpur Sikri are the Hiran Minar that Akbar built in memory of his favourite elephant, Tomb of Sheikh Salim Chishti, Birbal’s House and the Diwan-i-Khas. On arrival in to Agra, we check in to the hotel. 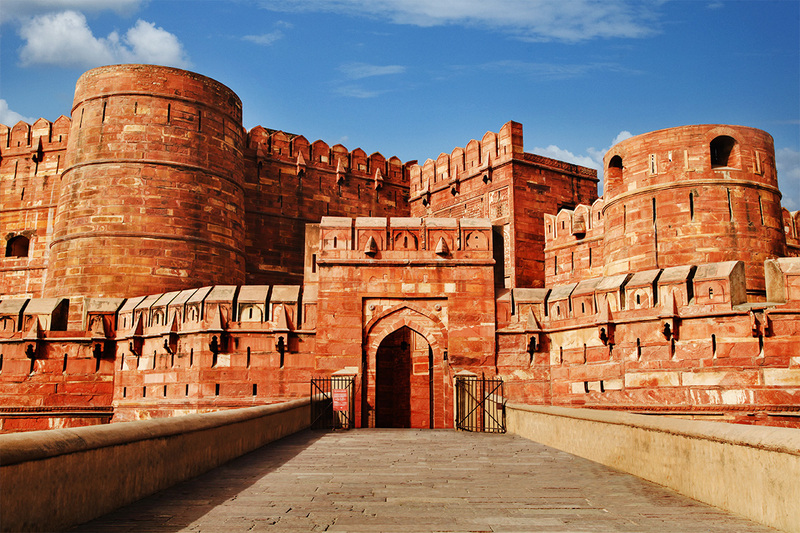 Later, head out on a sightseeing tour of Agra Fort. An outstanding example of Mughal architecture and the seat and stronghold of the Mughal Empire under successive generations. Shah Jahan, the Taj’s creator, spent the last years of his life imprisoned at the fort by his son Aurangzeb. It was built in the late 1560`s by their predecessor, Akbar, with later embellishments by Jehangir, his son, and Shah Jahan, his grandson. This morning we head out for the big one! 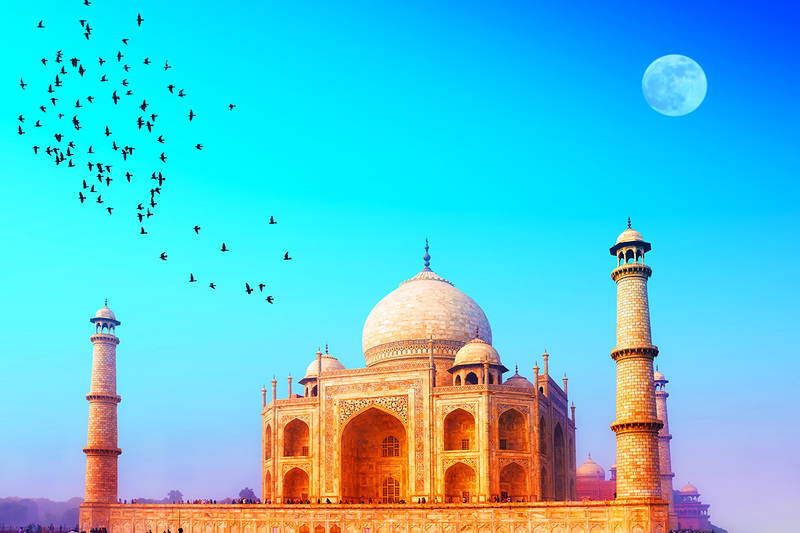 The Taj Mahal, for a spectacle not to be missed— a sunrise visit to the legendary Taj Mahal, built by Emperor Shah Jahan in the 17th century as a mausoleum for his wife Mumtaz Mahal, a masterpiece in marble and one of the world’s most famous landmarks. As the sunrises, a chaste and secretive image of the Taj starts to emerge, casting a very soft light illuminating the contours of this enchanting monument in marble. Referred to as one of the wonders of the world, the Taj Mahal in Agra is the epitome of tourism in India and is celebrated for its architectural magnificence and aesthetic beauty. There is plenty of time to explore the grounds of the Taj Mahal gardens before returning to the hotel for breakfast. Post breakfast we make our way to Orchha. This historic village on the banks of the boulder-strewn Betwa River showcases a supreme display of Mughal architecture, some of which is similar to that of nearby Khajuraho with much grander palaces and cenotaphs dotting the pastoral landscape as well. The atmosphere in Orchha, though, is far more laid-back and hassle-free, which makes for a relaxing stay. This morning we explore Orchha village. Orchha’s fort complex, the entrance of which is a multi-arched bridge, has three impressive palaces placed in an open quadrangle. The first of these is the Jehangir Mahal, built by Raja Bir Singh Ju Deo in the 17th century, to mark the occasion of Emperor Jehangir’s visit to the city. Fragile chhatries and ornate trellis work heighten the effect of artistic richness. The Raj Mahal was built by Madhukar Shah, the religious predecessor of Bir Singh Ju Deo. The interiors boast of intricate murals, depicting various religious themes. The Rai Praveen Mahal was built for the famous musicianpoetess paramour of King Indramani, Rai Praveen, as a mark of admiration by Emperor Akbar. There are 14 cenotaphs or chhatries to the rulers of Orchha, across the Kanchana Ghat of the Betwa River. 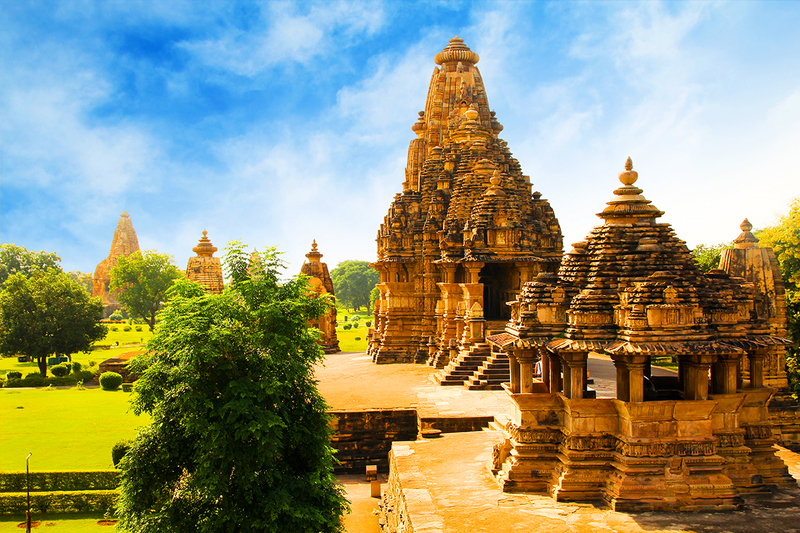 We then continue our journey to Khajuraho. 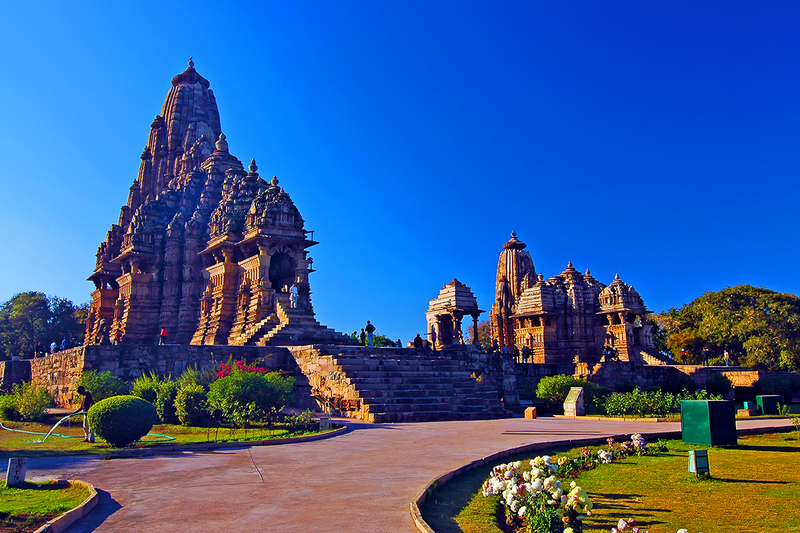 In the afternoon we explore Khajuraho’s Eastern Group of temples. This group comprises of two historic Jain temples – the Adinath Temple lavishly embellished with sculpted figures, and the Parsvanath Temple, the largest Jain temple, sculpted with charming detail. There are other shrines such as the Vamana Temple with apsaras in sensuous poses, and the Javari Temple that has a richlycarved doorway. Continue to the Western Group of temples which are entirely Hindu, and constitute some of the finest examples of Chandela art at its peak. The largest being the Kandhariya Mahadev dedicated to Lord Shiva, followed by a granite temple – Chaunsath Yogini. The Chitragupta Temple is dedicated to the Sun God, while the Vishwanath Temple sports a three-headed image of Brahma – the Creator of the Universe. The Lakshmana Temple is superbly decorated, while the Devi Jagdambi Temple is dedicated to Goddess Kali. Other temples in the Western Group include the Varaha Temple with a ninefoot high boar-incarnation of Lord Vishnu, the Matangeshwara Temple with an eight-foot high lingam, and the Brahma Temple. After breakfast we leave Khajuraho behind us and continue our journey east to Allahabad. Allahabad is among the largest and holiest cities in Uttar Pradesh. It stands at the confluence of two of India’s holiest rivers, the Ganges and the Yamuna. Sangam, as the confluence is called, is the venue of many sacred fairs and rituals and attracts thousands of pilgrims throughout the year. This number swells to millions during the world famous Kumbha Mela. A third mythical river, the Saraswati, believed to flow underground towards the Sangam, gives the confluence its other name ‘Triveni’. On arrival, the rest of the afternoon is free to explore this holy city at your own pace. This morning enjoy a tour of Allahabad including a visit to the Fort, built from 1583 onwards by Akbar at the confluence of the two great Rivers Ganges and Jamuna. The largest of Akbar’s forts, although most of its original form has been impaired by poor early restoration work. The fort consists of a beautiful zenana palace with a fine baradari or pavilion with a central square hall, carved on 64 columns surrounded by a deep veranda of double columns with clusters of four in each corner. Continue to the Khusrau Bagh, once the pleasure garden of Jahangir, son of Akbar. It houses the tomb of Prince Khusrau, elder son of Shah Jahan, who died in 1615. His tomb was completed seven years later and is a large domed structure in Mughal style. Built in the garden enclosure, the actual burial chamber is underground with enriched decorative plasterwork. The complex has two other tombs, one of Khusrau’s sister and the other of his mother. We then continue on to one of India’s holiest meccas, Varanasi. Located along the west bank of the holy River Ganges in the state of Uttar Pradesh, the city of Varanasi is a sacred Hindu pilgrimage site and is one of the oldest. It is a city, which enshrines the very essence of Hinduism—temples, shrines and devotees, sunrise boat rides, flower ceremonies with traditional music and walks on the ghats. 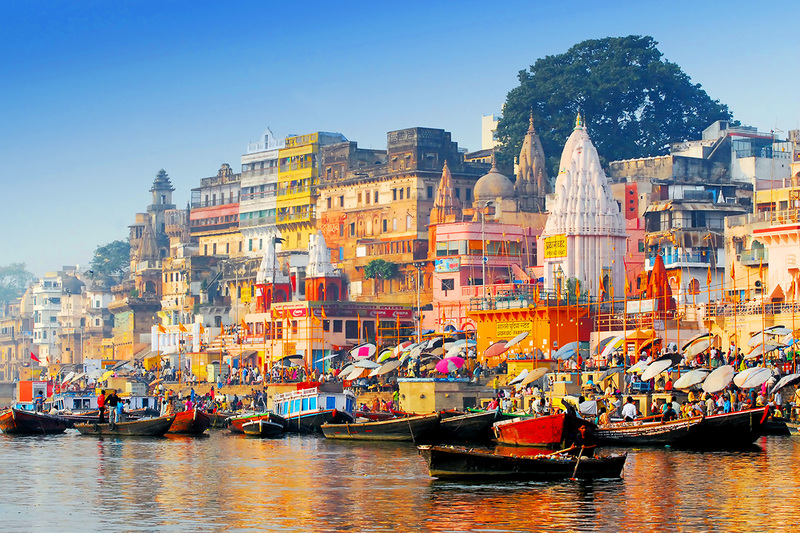 A city of colourful bazaars exquisite and bright silks, festivals – all centring around the teeming ghats of the Holy Ganges. This evening we head to the Daswamedha Ghat along the River Ganges to witness the special Hindu Aarti ceremony performed. Every evening at 1730 hour (in Winter), a magical Aarti is performed at Dashwamedha Ghat. Halt your boat right at the steps for the best view. The presiding priests stand on a wooden chauki in the water. To the chant of Sanskrit mantras, and the clash of cymbals and drums, the river is worshipped with flowers, incense, sandalwood, milk and vermilion. First the blazing camphor lamp and then the many- flamed aarti lamps are raised high and then arched back to the water, the dark river reflecting the golden flames as Ganga accepts the worship. 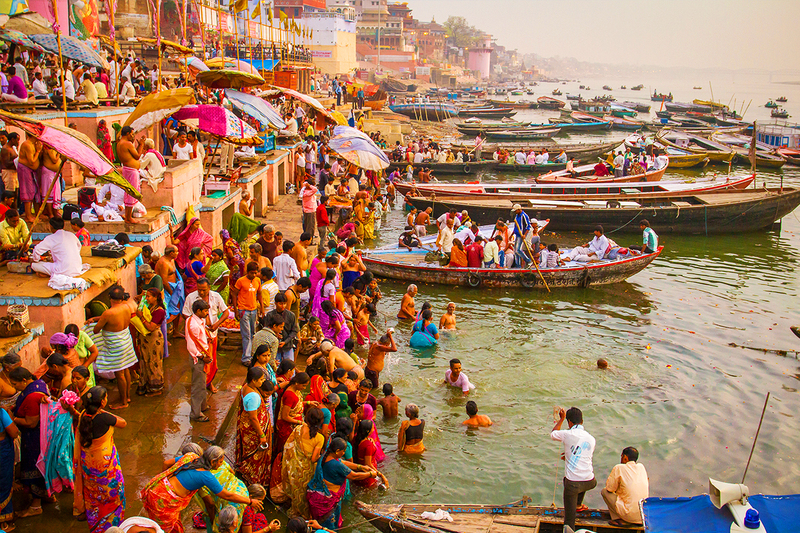 Varanasi’s principle attraction is the string of bathing ghats, which line the western ghats of River Ganges. The spectacular 4 Km sweep of the Ghats is a unique sight, best viewed at dawn. This morning we take a boat cruise on the Ganges to soak in the vibrant colour and life of Varanasi (subject to water levels). An early morning boat ride presents an incredible scene as the multitudes of devotees come to the river to pay homage to the Sun God. Pass the bathing ghats where thousands of pilgrims immerse themselves in the holy water of the Ganges River and the burning ghats where cremations are conducted. On our return we visit the bazaars (local market) and Kashi Vishwanath Temple – the most sacred of the shrines dedicated to Lord Shiva. We then return to the hotel for breakfast where to morning is at leisure. This afternoon, we visit the site where Lord Buddha had preached his first sermon or in religious language, set in motion the Wheel of Law (Maha-Dharmachakra-Pravartan) enshrining the principles of his teaching into laws. 200 years later, in 3rd century BC, the Mauryan Emperor Ashoka who spread the Buddha’s message of love and compassion throughout his vast empire, built massive stupas, viharas and monasteries making it the centre of the Buddhist world. Several Buddhist structures were raised at Sarnath between 3rd century BC and 11th century AD and today it presents the most expansive ruins amongst places on the Buddhist trail. This morning we leave Varanasi behind us and head to Lucknow. For all its modernity, Lucknow remains true to its cultural past, impeccable manners, a courtly diction, and a love for the arts and all beautiful things. The capital city of Uttar Pradesh, Lucknow, the erstwhile Awadh or Oudh still preserves the spirit of the past era. On arrival the afternoon is free to explore and enjoy this old World city. This morning we make the most of Lucknow and head out to discover its treasures. We begin with Bara Imambara, built by Nawab Asafuddaula to provide relief to his subjects during the famine of 1784. The splendor of this edifice is a reminder of the past glory of Nawab of Oudh. The Imambara is unique for the absence of pillars or supports in the main hall, which stands 50 feet tall. Continue to the Shah Najaf Imambara, the tomb of Nawab Ghaziuddin Haider, and his family is housed in this majestic white domed building. The tombs are plated in silver and gold and the interiors are ornate with floral designs and chandeliers. Also visit the Jama Masjid, this grand mosque was built by Muhammad Ali Shah in typical Mughal style with tall minarets and onion-shaped domes; Lucknow Residency built during 1780-1800, it was once the political residence of the British officials and Husainabad Picture Gallery, located near the Husainabad Tank houses portraits of the rulers of Awadh. Following todays sightseeing, enjoy a shopping tour of The city of Nawab (Lucknow) where you can find that special memento of your time in India. The rest of the afternoon is then at leisure. After breakfast we have a leisurely morning before making our way to the train station to board our train to Delhi. No trip the India is complete without experiencing a train journey! Without a shadow of a doubt, the best way to see India is not on a plane at 35,000 feet, but at ground level on the incredible Indian railway system. You can safely forget media images of overcrowded suburban trains with people sitting on the roof. On a long distance train in an air-conditioned carriage all seats are reserved and it’s a safe, civilised & comfortable way to get around India. Our train journey to Delhi takes around 7 hours giving you time to watch the world go by. On arrival you will be transferred to your hotel in Delhi. After breakfast, the day is at leisure. Later, you will be met at your hotel by a Webjet representative and assisted with your transfer to the international airport for your onward flight home. Arrive home in Australia today. Simply add on one of these brilliant tour extensions which all include ~ internal airfares, airport transfers, accommodation, sightseeing and more! Return international airfares with a full service airline, including 23kgs checked luggage. 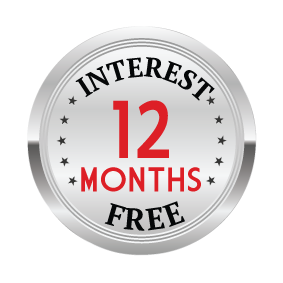 13 nights’ accommodation on a twin share basis in the hotel standard of your choice! 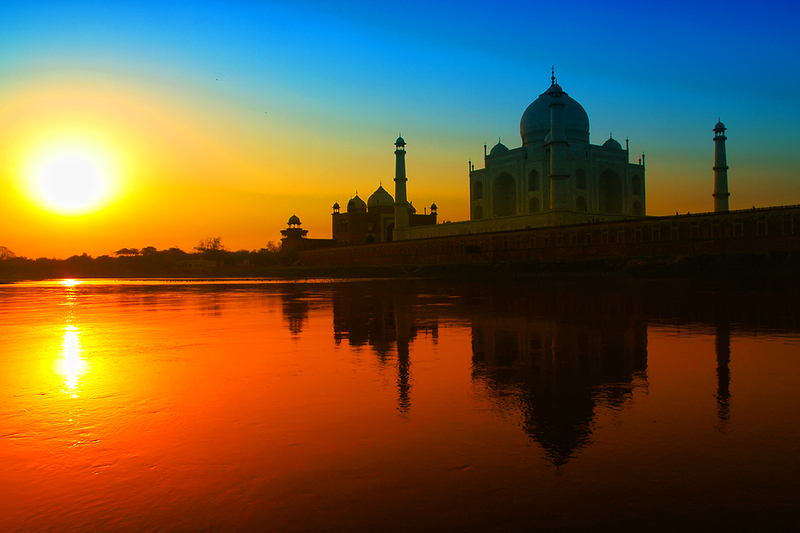 Explore in and around the grounds of the Taj Mahal! Tour Excludes: Travel insurance, Visas, Anything which is not mentioned in the itinerary. Extensions: To choose your extension, you will need to purchase both your North India voucher and the extension voucher (located AFTER you hit ‘Buy Now’) per person. Multiple extensions may be purchased. Please note: If you are a single traveller you will need to purchase the single supplement for both the 15 day tour and the optional extension. Adelaide – Return economy airfare with Singapore Airlines (Malaysia Airlines or similar if Singapore Airlines is unavailable). A $250 interstate surcharge applies per person, please purchase the interstate fee from the extras page in addition to your 15 Day voucher. We are unable to guarantee which airline you will travel with as flights will be booked subject to promotional fare availability for your travel dates. You can purchase you single supplement by clicking here. Any Optional Tours purchased after your initial booking (and 60 days before departure) must be emailed to customerexperience@webjetexclusives.com.au to ensure your booking is correctly updated. Failure to do so may result in you not being accepted on this optional tour and your purchase will be refunded. Note that while Optional Tours provide an excellent opportunity to further explore this wonderful country, it will also reduce the leisure time described in the itinerary. Optional Tours requested within 60 days of travel cannot be accepted. 3. Cancel the vouchers purchased and receive a full refund. The quote will include instructions on how to make payment and failure to pay by the stipulated time will cause the quote to lapse. Should you choose to vary your arrival date, departure date or airline from the promotional airfare, we are unable to offer the group airport transfer and this will need to be arranged at your own expense. We are unable to provide additional accommodation for early arrivals or late departures and this will need to be arranged at your own expense. Final Payment is due no later than 180 days prior to departure. A final invoice will be emailed to you prior to 180 days. Exchanging Money: When exchanging Australian dollars into Indian Rupees or withdrawing funds from an ATM while in India, always retain the transaction receipt. You may be required to present the receipt as proof of withdrawal if purchasing items with cash. Gratuities aren’t compulsory on your trip, but they can make a big difference to locals employed in the tourism industry. Your guide will hand around two envelops towards the end of the tour (1 Tour Guide and 1 Driver envelope) to make the process as easy as possible. Your Varanasi and Enchanting North India Tour is subject to availability at the time of your booking. We advise you to book early to avoid disappointment.